The medical equipment industry is driven by innovation and new technologies. The last decade has seen an unprecedented growth in innovative and improved technologies, which led to the development of medical devices and advances in the healthcare industry. According to the World Health Organization (WHO), a medical equipment is defined as “an article, instrument, apparatus or machine that is used in the prevention, diagnosis or treatment of illness or disease, or for detecting, measuring, restoring, correcting or modifying the structure or function of the body for some health purpose.” Medical equipment ranges from simple tongue depressors to complex programmable pacemakers and CT scanners . 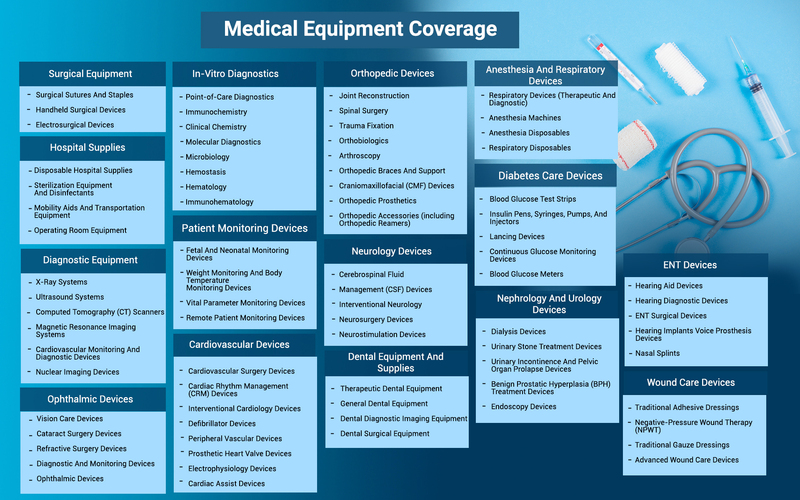 The medical equipment market consists of sales of medical equipment and related services by entities (organizations, sole traders and partnerships) that manufacture medical equipment which is used in diagnosis, treatment and monitoring of medical conditions. This industry includes establishments that manufacture in-vitro diagnostic devices, dental equipment and supplies, ophthalmic devices, cardiovascular devices, hospital supplies and other medical devices. 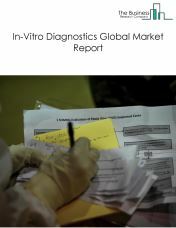 The in-vitro diagnostics devices market consists of sales of in-vitro diagnostic equipment and related services by entities (organizations, sole traders and partnerships) that manufacture in-vitro diagnostics. This industry includes establishments that manufacture diagnostics devices used in microbiological diagnosis, hematological diagnosis, molecular diagnosis, point of care diagnosis and others. 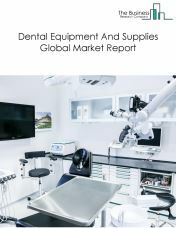 The dental equipment and supplies market consists of sales of dental equipment and related services by entities (organizations, sole traders and partnerships) that manufacture dental equipment and supplies. This industry includes establishments that manufacture devices such as therapeutic dental equipment, general dental equipment, dental diagnostic imaging equipment and dental surgical equipment. 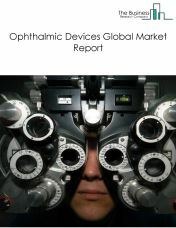 The ophthalmic devices supplies market consists of sales of ophthalmic devices and related services by entities (organizations, sole traders and partnerships) that manufacture ophthalmic devices used in the diagnosis and treatment of eye related diseases. This industry includes establishments that manufacture vision care devices, cataract surgery devices, refractive surgery devices, diagnostic and monitoring ophthalmic devices used in conditions such as eye infections, cataract, glaucoma, retinal detachment and other medical conditions. The diagnostic equipment market consists of sales of diagnostic equipment and related services by entities (organizations, sole traders and partnerships) that manufacture diagnostic equipment used in diagnosis of various diseases. This industry includes establishments that manufacture diagnosis equipment such as X-ray systems, ultrasound systems, computed tomography (CT) scanners, magnetic resonance imaging systems and other diagnostics equipment. The cardiovascular devices market consists of sales of cardiovascular devices and related services by entities (organizations, sole traders and partnerships) that manufacture cardiovascular devices used in diagnosing and treating cardiovascular diseases. This industry includes establishments that manufacture devices such as cardiovascular surgery devices, cardiac rhythm management (CRM) devices, interventional cardiology devices, peripheral vascular devices, electrophysiology devices and other devices used in cardiovascular surgeries, treating arrhythmia and other cardiovascular diseases. The hospital supplies market consists of sales of hospital supplies and related services by entities (organizations, sole traders and partnerships) that manufacture hospital supplies. This industry includes establishments that manufacture disposable consumables such as glucose test strips, conventional syringes and others. It also includes establishments manufacturing sterilization equipment and disinfectants used in operation theaters during surgeries and mobility equipment such as wheelchairs, walkers and others to transport patients from one place to another. The surgical equipment market consists of sales of surgical equipment and related services by entities (organizations, sole traders and partnerships) that manufacture surgical equipment used during surgeries. This industry includes establishments that manufacture surgical sutures and staples, handheld surgical devices such as forceps, scalpels retractors and scissors and monopolar, bipolar and ultrasonic electrosurgical instruments. The orthopedic devices market consists of sales of orthopedic devices and related services by entities (organizations, sole traders and partnerships) that manufacture orthopedic devices used in treating bone abnormalities. This industry includes establishments that manufacture devices used in joint reconstruction, spinal surgeries, craniomaxillofacial surgeries and orthobiologics implants. It also includes establishments manufacturing orthopedic accessories to fix or remove implants from the body and artificial devices to replace missing body part from the body under orthopedic prosthetics. 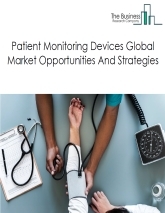 The patient monitoring devices market consists sales of patient monitoring devices and related services by entities (organizations, sole traders and partnerships) that manufacture patient monitoring devices used in monitoring vital health parameters. This industry includes establishments that manufacture fetal and neonatal monitoring devices used to monitor heart rates in neonates and pregnant mothers, body weight and temperature monitoring devices, vital parameter monitoring devices used during surgeries and remote patient monitoring devices. The diabetes care devices market consists of sales of diabetes care devices and related services by entities (organizations, sole traders and partnerships) that manufacture diabetes care devices used to monitor blood glucose levels in diabetic patients. 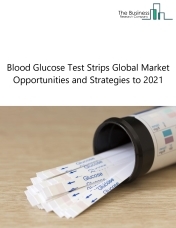 This industry includes establishments that manufacture blood glucose test strips used to check blood glucose levels, Insulin Pens, Syringes, pumps and Injectors used to inject insulin, continuous glucose monitoring devices, blood glucose meters and others. The nephrology and urology devices market consists of sales of nephrology and urology devices and related services by entities (organizations, sole traders and partnerships) that manufacture nephrology and urology devices used in diagnosis and treatment of kidney and genitourinary diseases. This industry includes establishments that manufacture dialysis devices used during kidney failures and kidney dysfunctioning, urinary stone treatment devices used in treating kidney stones, urinary incontinence & pelvic organ prolapse devices, endoscopy devices and other devices. The ENT devices market consists of sales of ENT devices and related services by entities (organizations, sole traders and partnerships) that manufacture ENT devices used in diagnosis and treatment of ear, nose and throat diseases. This industry includes establishments that manufacture hearing aid devices, hearing diagnostic devices, hearing implants, voice prosthesis devices and other devices. The anesthesia and respiratory devices market consists of sales of anesthesia and respiratory devices and related services by entities (organizations, sole traders and partnerships) that manufacture anesthesia and respiratory devices used in diagnosis and treatment of respiratory diseases. This industry includes establishments that manufacture respiratory devices used to provide medication in medical conditions such as asthma, cystic fibrosis, acute cute respiratory distress syndrome and others. The neurology devices market consists of sales of neurology devices and related services by entities (organizations, sole traders and partnerships) that manufacture neurology devices to diagnose and treat neurological diseases. This industry includes establishments that manufacture shunts and external drainage systems under cerebrospinal fluid management(CSF) devices to treat medical condition such as hydrocephalus. It also consists of interventional neurology devices to treat neurovascular diseases and neurosurgery devices. The wound care devices market consists of sales of wound care devices and related services by entities (organizations, sole traders and partnerships) that manufacture wound care devices which prevent wound infections and promote wound healing. This industry includes establishments that manufacture traditional adhesive dressing and traditional gauze dressings used to prevent wound infections. It also includes establishments manufacturing negative-pressure wound therapy devices that uses NPWT technique to promote chronic wound healing and other advanced wound care devices. Medical Sensors Market By Type (Diagnostics And Imaging, Monitoring And Therapeutics), By Products (MRI and X-ray Equipment, Pacemakers And Defibrillators) and By Regions - Global Industry Analysis, Size, Share, Growth, Trends, and Forecast to 2023. The medical sensors market consists of manufacturers’ sales of sensors that are used in medical equipment and that convert various forms of stimuli such as biological, chemical and physical signals produced by the body into electrical signals for analysis. This report describes and evaluates the global medical sensors market. It covers two five-year periods, 2014 to 2018, termed the historic period, and 2018 through 2023, the forecast period. The medical sensors market consists of manufacturers’ sales of sensors that are used in medical equipment and that convert various forms of stimuli such as biological, chemical and physical signals produced by the body into electrical signals for analysis. The patient monitoring devices market (or patient monitoring equipment market – the two terms are interchangeable) consists of the sales of patient monitoring devices and related services by entities (organizations, sole traders and partnerships) that manufacture patient monitoring devices used in monitoring vital health parameters. The major orthopedic joint replacement implants market includes implants used in knee and hip replacement surgical procedures. Knee and hip joints are affected by common disease conditions such as rheumatoid arthritis, osteoarthritis, post-traumatic arthritis, injuries, and obesity. The growing prevalence of these disease conditions have led to increases in knee and hip joint replacement surgeries. The global major orthopedic joint replacement implants market was valued at nearly $16.6 billion in 2017. This can be attributed to ageing populations and high prevalence of obesity, arthritis, and trauma. 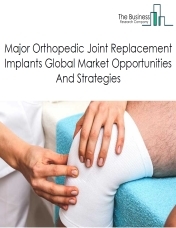 The global major orthopedic joint replacement implants market is expected to grow from nearly $16.6 billion in 2017 to $20.1 billion in 2022 at a CAGR of about 3%. Growth of the market will be driven by an increasing geriatric population, rising prevalence of chronic diseases such as obesity and arthritis, and increasing awareness about the importance of joint replacement surgeries. The market will be negatively affected by a shortage of skilled workers and the growing usage of novel and alternative therapies for end-stage arthritis. Government initiatives to expand healthcare insurance and funding to promote the medical devices industry will boost the market globally. Developing economies such as China, India, and Brazil are attracting foreign direct investments (FDIs) as a result of globalization and economic growth. Robotics and 3D printing technology are gaining traction with major companies such as Stryker and Smith & Nephew that employ these technologies to provide customized surgical options to surgeons and patients. Wearable medical devices are small electronic products, often consisting of one or more sensors, and having computational capability. They are embedded into items that are attach to the body parts, such as head, feet, arms, wrists and waist. They can resemble a watch, eyeglasses, some clothing, contact lenses, shoes or even jeweler. Wearable medical devices can be generally divided based on consumer or non-consumer applications. These two categories can be further segmented based on the particular sector the product targets. Straps and headbands are the most common application areas of wearable medical devices. The increasing demand for devices in the remote patient monitoring devices and home healthcare industries is expected to propel the demand for wearable medical devices. 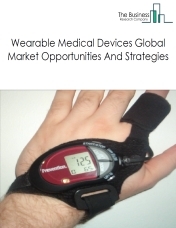 Furthermore, increasing focus on fitness, growing awareness among the population, rise in base of aging population, and a healthy lifestyle orientation are also expected to impact the wearable medical devices market.